Unabated downpour for the last few days has thrown the normal life of the people of Dima Hasao district out of gear. Incessant rains triggered massive landslides at six places in between New Haflong and Lumding area including Mupa, Daotuhaja and Phaiding resulting in the disruption of road and railway communications in the district. The rain waters have also badly affected the railway line in between New Haflong and Jatinga. 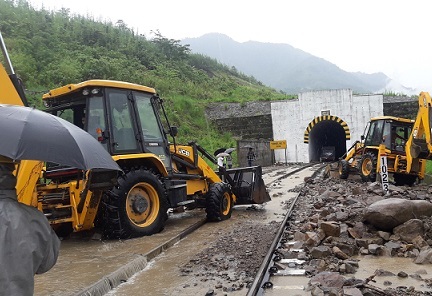 The divisional railway manager (DRM) of Northeast Frontier Railway (NFR), Ashish Sharma, rushed to New Haflong by a special train to review the condition of the railway line in the district. However, he could not move towards Silchar due to the road blockade caused by landslides. Later, the DRM went to Jatinga Lampu to review the situation in the area. He also informed that the restoration work the affected railway tracks has been under process. The Northeast Frontier Railway (NFR) authorities have suspended all the train services in the Lumding-Silchar route.